Scientific Facts on Does thorium have the potential to become an alternative nuclear fuel? Does thorium have the potential to become an alternative nuclear fuel? Context - Currently, nuclear reactors use enriched uranium as a fuel source, but uranium is relatively rare. Thorium is more common and could also be used as fuel. This is a faithful summary of the leading report produced in 2015 by the Organization for Economic Co-operation and Development (OECD): " Nuclear Energy Agency of the Organisation for Economic Co-operation and Development (OECD)"
The isotope 232 of thorium (232Th) is more abundant in nature than uranium, which is one of the reasons why, since the early days of the development of nuclear energy, it has been considered an alternative to uranium as a nuclear fuel. This report provides a scientific assessment of thorium’s potential role in nuclear energy both in the short and longer term, addressing diverse options, potential drivers and current impediments to be considered if thorium fuel cycles developments are to be pursued. The report concluded on this basis that the use of thorium in the nuclear fuel cycle as a complement to the uranium/plutonium cycle showed potential for improving the medium-term flexibility of nuclear energy and its long-term sustainability. Is thorium a viable alternative to uranium as a nuclear fuel? In technical terms, thorium is a viable alternative since it is an effective fissile material, which produces less unwanted waste products that uranium. However, in order to be deployable at a large scale, it needs large amounts of uranium-233, which is currently only available by the use of thorium mixed with “traditional” uranium/plutonium fuels. From the economic point of view, given that the thorium cycle has not yet been developed on an industrial scale, there is no accurate data on the costs associated with the different stages of this cycle. The development of thorium fuel cycles at short- to medium-term development of thorium fuels would only be carried out in a step-wise fashion and in synergy with the existing uranium/plutonium fuel cycle. What are the advantages of thorium as a fuel source? Why is thorium not currently used as a nuclear energy source? One of the current limiting factors to the full introduction of thorium fuel is that the thorium cycle must be initiated by high energy neutrons to generate the first fissile isotope (uranium-233), produced from uranium/plutonium fission. Until the production of the required quantities of 233U would make the thorium cycle autonomous, any industrial application of thorium as a nuclear fuel would therefore continue to require the neutrons from the existing uranium/plutonium cycle. Further, the full benefits of a closed, self-sustaining thorium/233U fuel cycle may only be realised in dedicated “breeder” reactors (generation IV or beyond), which are still in the design study phase and may not be operational before the end of this century. The development of a fully self-sustaining thorium cycle would also require the development of industrial scale reprocessing capabilities to recover 233U from spent fuel, along with the development of facilities for fuel fabrication from the recycled material. In terms of potential military use, the technical obstacles to the use of thorium cycle would be similar to those of using uranium enriched to less than 20% as it is the case in the uranium/plutonium fuel cycle. A number of regulations that govern the use of radioactive materials and its by-products have limited the development of thorium fuels based on the use of highly enriched uranium, which use is severely limited by international treaties on non-proliferation of nuclear weapons. Which challenges should be considered for thorium use in future nuclear energy systems? Continuous improvements in the management of fissile materials in current and future fuel cycles that may create opportunities from the short-term onwards, although with varying degrees in their benefits and disadvantages. The mitigation of natural resources and natural uranium scarcity: although this is not likely to happen in the near term, it can be considered a long-term issue (post-2050). What about the management of thorium fuels waste? 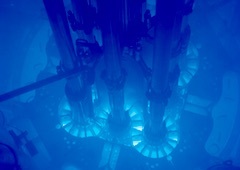 For a given amount of thermal energy produced in a reactor core, the amount of fission products is essentially similar in thorium or uranium fuels. But the use of thorium as nuclear fuel is often associated with advantages in the lower radioactivity and thus toxicity of the resulting waste as compared to conventional uranium fuels. It must not be overlooked, however the very long transition phases of use of mixed fuel forms before a full thorium/233U cycle can be achieved (see above). One major challenge associated to thorium reprocessing is that some amounts of uranium-232 present together with uranium-233 are difficult to separate and it emits highly energetic gamma radiation, from which it is necessary to protect workers. What would be the potential health and safety impacts of thorium technology use? Both the design of future reactors and a safety analysis methodology are currently being developed and several limiting factors have been identified in the development of the new reactor concept. Although the methodology used (ISAM) has already identified strengths and limitations, the calculation tools presently available do not allow for the same level of accuracy all the types of accidents to be considered. The grinding and crushing of thorium ores release radon 220Rn, the analogue of the U-decay-chain’s 222Rn, but its short half-life (56 seconds) would only pose a hazard to those in the immediate vicinity. This radon hazard, however, could be heightened as its concentration in bastnasite or monazite ores used to extract thorium is higher than in other, less radioactive ores and its inhalation remains a health risk. The use of concentrated strong acids and strong bases and the solvent extraction systems as well as radioactive waste streams represent also a significant chemical hazard, regardless of processing scheme, but this hazard would not be attributable to the nuclear fuel cycle itself. Any raffinate streams leaving the system still represent radioactive waste, albeit of a low specific activity. A further important factor to be considered when determining safety requirements for handling fuel discharged from thorium reactors and stored for five years is the gamma radiation it will still produce. What is the potential or this energy source? What is the place of geothermal energy in the energy mix? Biochar can be used as fuel or as a fertilizer, and is particularly relevant to developing countries.